A thick meat patty, oozing with juiciness, topped with crispy lettuce, a tomato slice, chunky guacamole, ketchup and maybe a tiny bit of mustard, finished off with a few slices of pungent dill pickles… All smothered by two fluffy sesame seed sprinkled buns. I bet I have all of you officially yearning for a gluttonous fast food burger, right? Good, because that was exactly my intent. However, before you grab your wallet and head to the closest drive-thru, you may want to read what I actually mean when I say “fast food burger”. Fast food burgers can easily be prepared in the comfort of your own home, in probably less time than it takes for you to grab your car keys, head to your car, drive to the fast food joint of your choosing, wait in the long line of cars filled with people who had the same food itch as you, order your grub (and reiterate that you want no tomatoes but extra lettuce so the person in the kitchen actually gets the memo), then wait another couple of minutes, pay for said food, and then drive away… Only to half enjoying what you purchased because you also need to pay attention to the road and make sure you don’t get trans fat-laden, grease all over your steering wheel. No one likes a greasy wheel! How about instead of going through that whole process, that might even leave you needing to hit the car wash, you plan in advance for moments of weakness such as this. Purchasing some ground meat (preferably free ranged) that you can store in your freezer, along with the other fixings (that you should always have on hand to begin with) you so choose to include on your favorite burger, is by far the best option when it comes to both time and health. I promise you, defrosting and then cooking the meat takes next to no time, at max 30 minutes (about the same amount of time it would take for you to go through the entire process of grabbing that fast food burger), if you defrost your meat by soaking it in a pot filled with lukewarm water. As for the processed white bun you probably drool over… While I am not going to tell you to completely ditch the buns (however my recipe does eliminate it), I would highly recommend you look into buns with no added sugar, and at least 4 grams of fiber per serving. Have I convinced you to whip your skillet out and fry up some burgers in Kelapo Coconut Oil (only to increase the health benefits)? Steam collard green leaves for roughly 2 – 3 minutes. Plunge in cool water and let sit. Form ground meat into two patties. Heat coconut oil in hot skillet (medium heat), distribute oil over entire pan. Place burgers in hot pan, and cook roughly 3 – 5 minutes per side, depending on how done you like your meat. 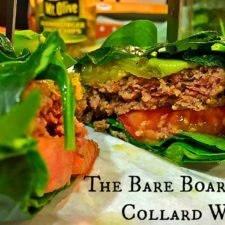 Lay a piece of parchment paper down then place two slices of dry collard green leaves on it, then lay your burger down, followed by tomato slices, spinach, guacamole and pickles. 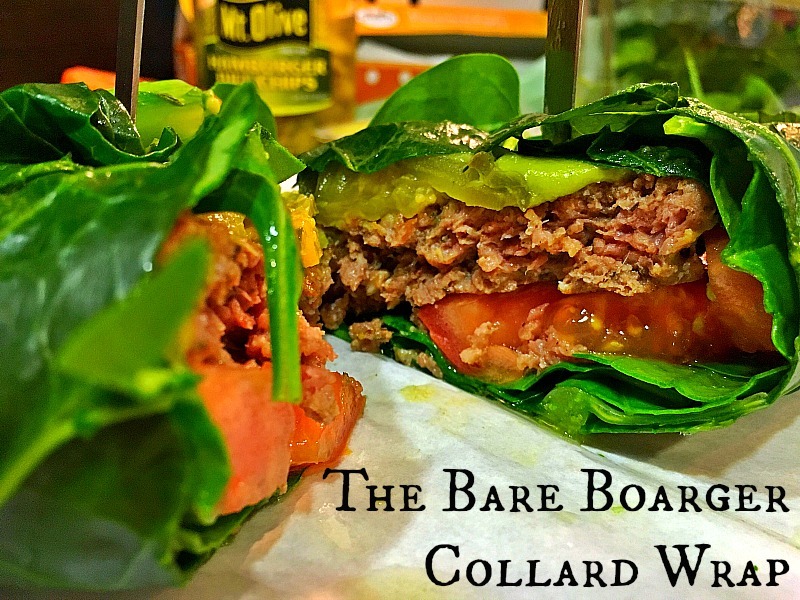 Good luck wrapping your collard greens around this combo… I warn you, it may not LOOK PRETTY… But I promise you, it IS tasty and far healthier for you than ANYTHING you’d get from a fast food restaurant!